Coinpeak is a powerful and simple tool that tracks the performance of your cryptocurrency portfolio and automatically syncs your balances, transactions, costs, and gains across all wallets and exchanges, based on the FIAT and/or cryptocurrency of your choice. • Privacy is paramount. Your portfolio data, API keys, and wallet addresses are kept completely private, never transmitted to our servers, and reside only in your device. 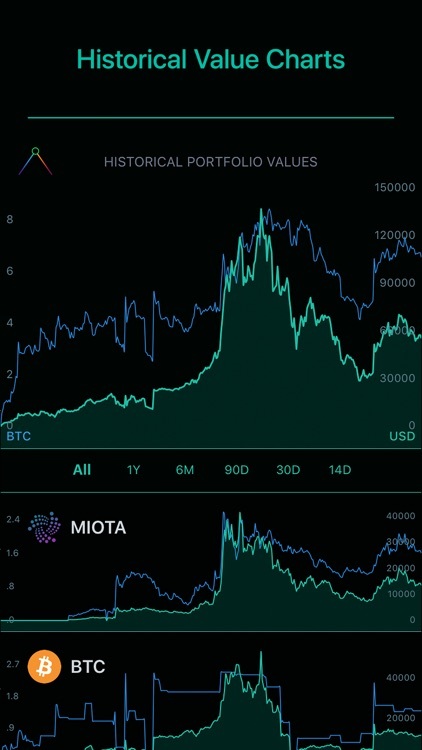 • Choose between two tracking modes: 'Balances Only' (Basic) or 'All Transactions' (Advanced) and track trades, transfers, current and historical values, cost per unit, total cost, realized / unrealized gains, and more. 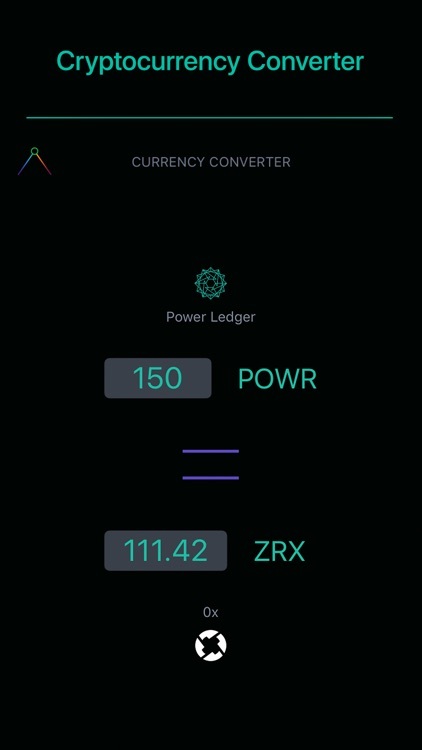 • Quickly sync your balances and transaction history through API and CSV imports from multiple wallets and exchanges. 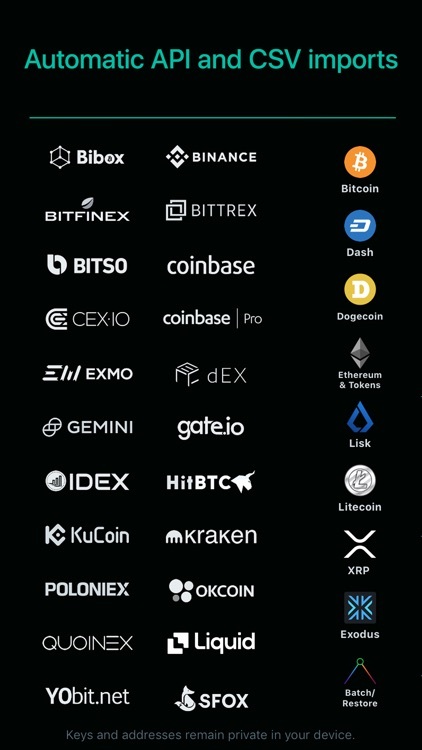 Currently available for: Bibox, Binance, Bitfinex, Bitso, Bittrex, CEX.io, Coinbase, Coinbase-Pro, ERC dEX, EXMO, Gate.io, Gemini, HitBTC, IDEX, Kraken, KuCoin, Liquid, OKCoin, Quoinex, Poloniex, SFOX, YObit, and most Bitcoin, Dash, DigiByte, Dogecoin, Ethereum, Lisk, Litecoin, and XRP addresses from wallets such as MetaMask, Exodus, Copay, imToken, Jaxx, Ledger Nano, Lisk Nano, Trezor, etc. 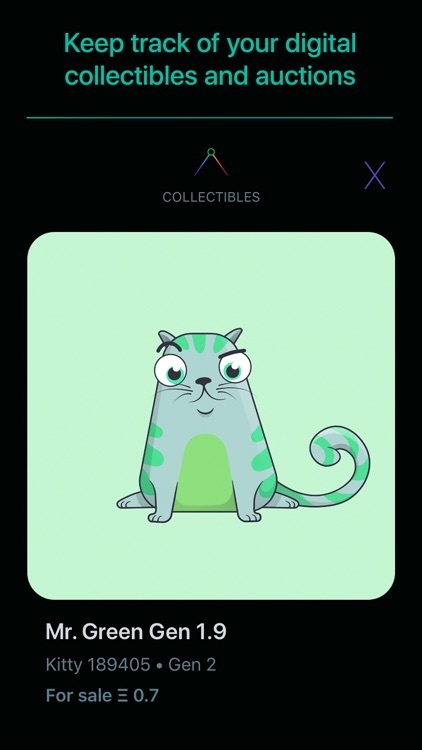 • Automatic imports from Ethereum wallet addresses include the balances of all your tokens. 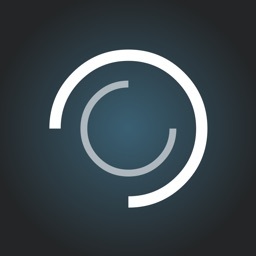 • Complete Exodus Wallet support through CSV file imports and automatic ETH address syncing. 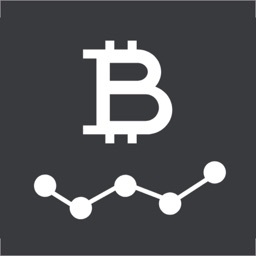 • CSV file imports are also available for Binance and Bittrex. 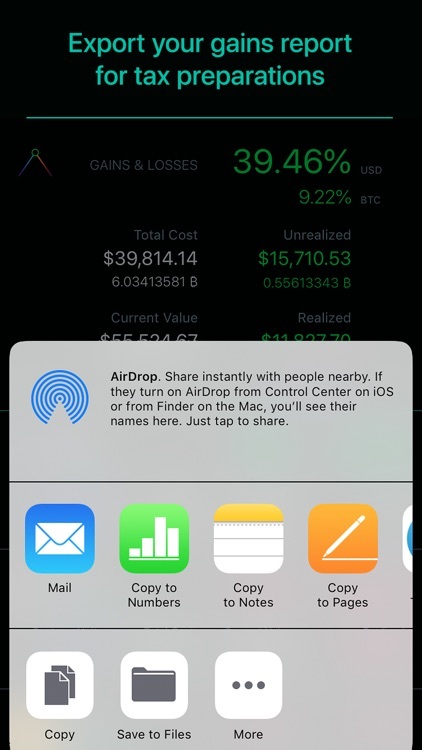 Use the "Batch Import Template" for other wallets or exchanges. 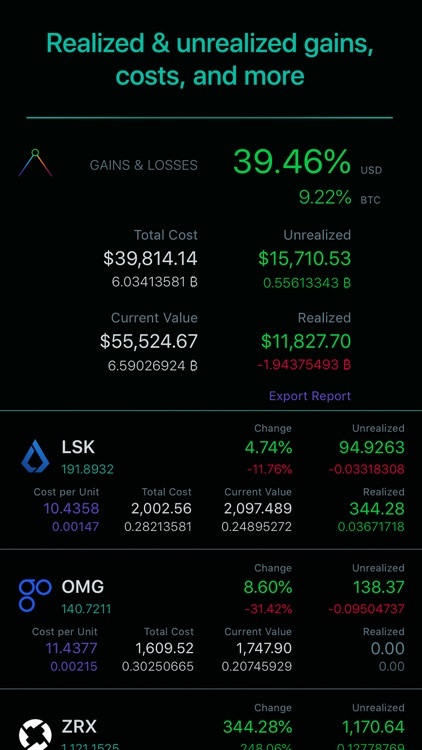 • Add the last touches to your portfolio by manually entering other coins, trades, wallets, and test scenarios. • Export your Realized Gains Report as a CSV file for tax preparations (Includes gain/loss from all sell trades). • Export a backup CSV file with all your transactions. • Select two currencies to base your portfolio & market values. You can pick any combination of FIAT and Crypto, and change them at your convenience. 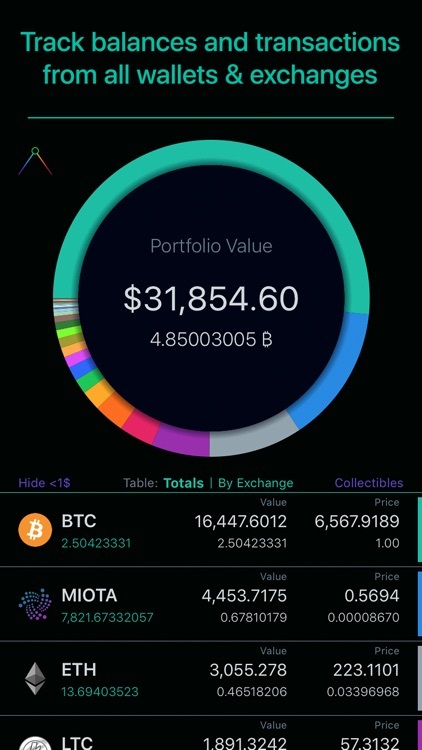 • View portfolio values and ticker prices based on Ethereum, Bitcoin, Litecoin, DAI, USDT, IOTA, Cardano, Dash, Monero, Neo, Lisk, XRP, and any other digital currency or token of your choice. 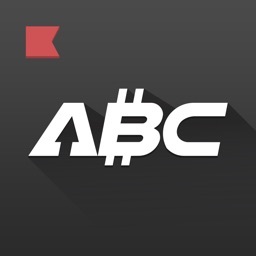 • Supports all active cryptocurrencies in the market, and major FIAT currencies. 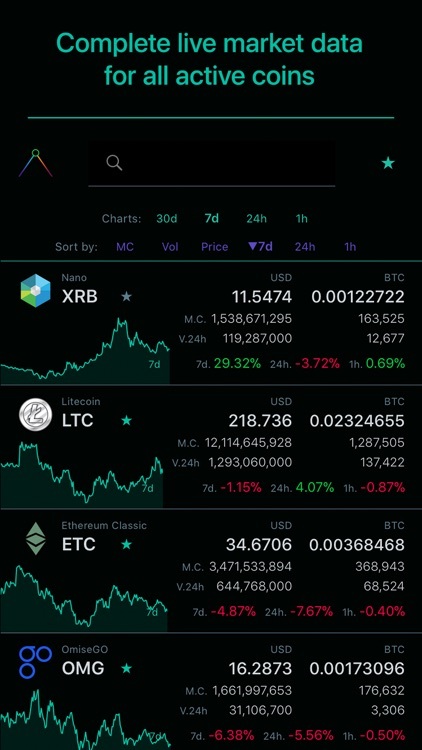 New tokens are listed as they become active in the market. 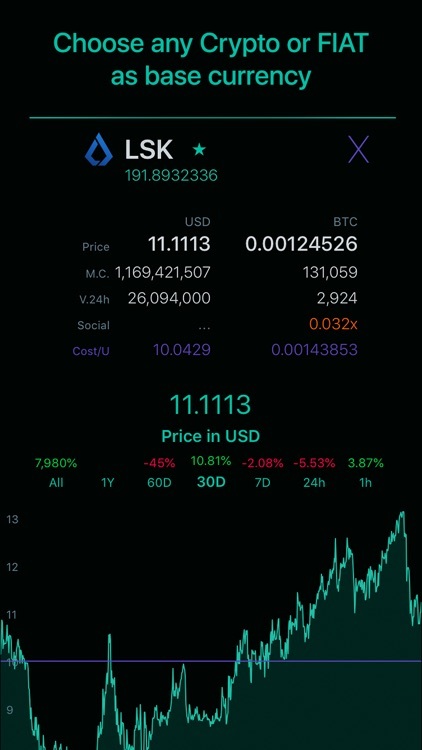 • Complete coin market information including prices, market cap, volume, trends for 1h, 24h, 7d, 30d, 60d, and 1y, historical data, cost per unit, and the coin's social media performance. 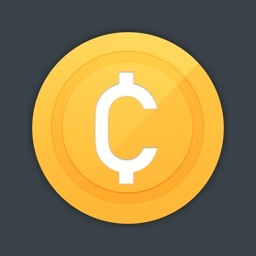 • Easy and fast Currency Conversion Calculator. 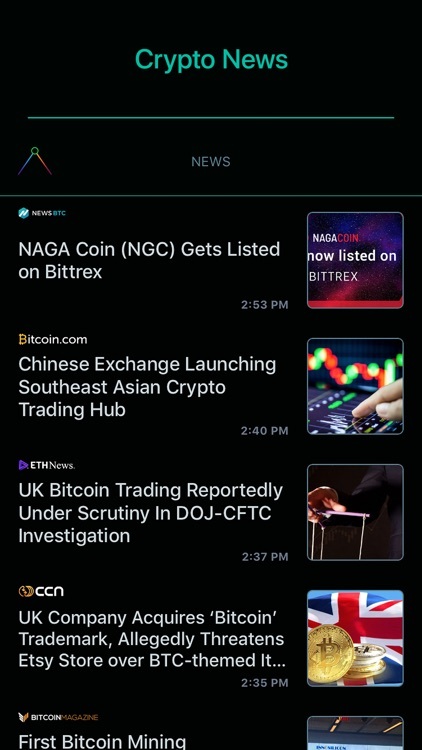 • Get the latest Crypto News without leaving your portfolio. 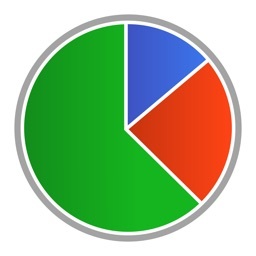 • Protect the privacy of your portfolio with Face ID, Touch ID or Passcode. 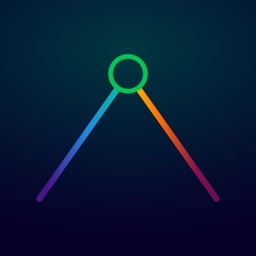 Coinpeak is available as a free download, with all it's features available and without ads. However, reloading the current market pricing data without waiting limits requires purchasing the "Coinpeak Unlimited" Subscription. • The "Unlimited" Subscription gives you access to the current market pricing data without limitations, allowing you to refresh the data anytime, as many times as you need. • "Unlimited" Subscription is available for 1 year, 6 months, or 1 month periods.